Toyapakeh is the port of arrival on Nusa Penida for most of the fastboats coming from Bali. It is also a very famous scuba diving site, especially for drift dives. Toyapakeh will probably be your first contact with Nusa Penida. Because it is the destination port of most speedboat companies. You can fin there some small warungs next to the beach, some homestays. But you can also most probably find someone to drive you to your hotel or to rent you a scooter. Most of the fastboat companies arrive between the harbor and the big jetty that hosts the ferryboats. You may see long lines of trucks waiting for the arrival of the ferryboat. This is where the building materials arrive for all construction projects of Nusa Penida. Toyapakeh is also a famous site for scuba diving or snorkeling. Currents are often important. You will have the pleasure to admire the corals and the aquatic fauna by letting you carried by the current. 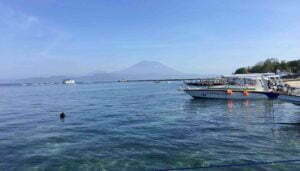 And if you are lucky you will also have a superb view of Mount Agung. 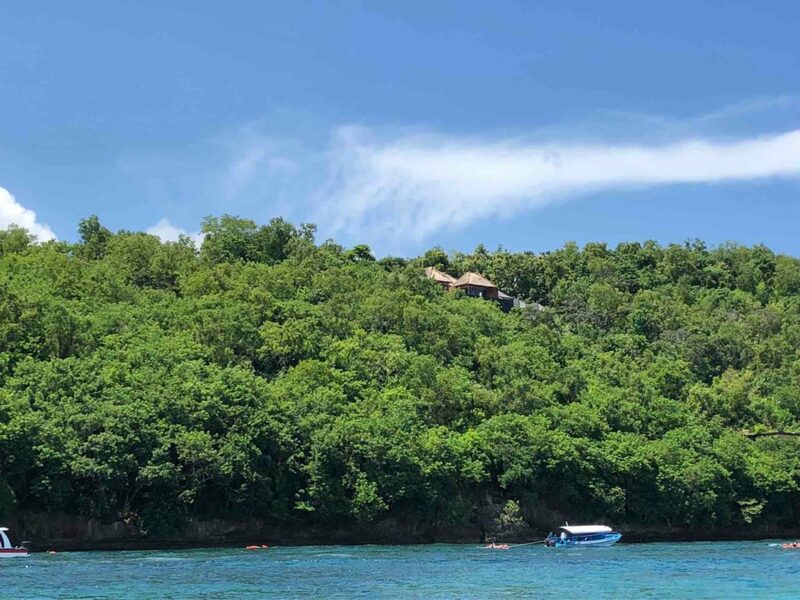 Toyapakeh is also the starting point for snorkeling trips that will usually bring you to see the manta rays, then to Crystal Bay, Gamat Bay, and eventually to the statues of Buddha sunk in front of Ceningan. The snorkeling trip usually ends up drifting along a wall of coral till the beach. You can also walk a small path that runs along the sea and passes under the three large houses in the form of huts. 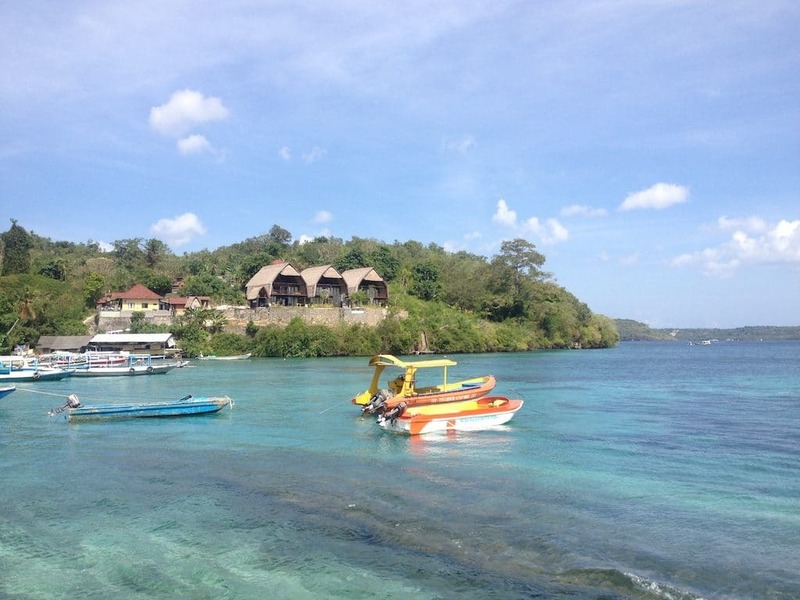 The Warnakali Diving Center is about 500 meters away. If you see a group of people wearing red caps on the port, it will likely be Warnakali staff waiting for the arrival or return of the center divers. You can see on the photo below the roofs of Warnakali dive center. And there is also the gray facade of the pool 3 meters deep which is used for training and pool discovery dives. It is also the starting point for small boats, public or private, that shuttle with Nusa Lembogan. The trip will only take 10 minutes and can be fun, although there is less to do in Lembogan than in Penida. Toyapakeh is also the only Muslim village on the island. So do not be surprised if most women wear a headscarf. You will find on this page all the return times to Bali.